Chen Yang, Zhi-Yuan Zhou,et.al. Nonlinear frequency conversion and manipulation of vector beams in a Sagnac loop. Opt. Lett. 44, 219-222 (2019). Ying-hao Ye, et.al. Experimental realization of optical storage of vector beams of light in warm atomic vapor. Opt. Lett. , 2019, 44(7): 1528-1531. Shi Bao-Sen, Ding Dong-Sheng, et.al., Raman protocol-based quantum memories. Acta Physica Sinica, 2019, 68(3): 034203. doi:10.7498/aps.68.20182215.(物理学报综述文章：基于拉曼协议的量子存储). SK Liu, e.t., Up-conversion imaging processing with field-of-view and edge enhancement Accept by Phys. Rev. Applied. Yu Y C, Ding D S, Dong M X, et al. Self-stabilized narrow-bandwidth and high-fidelity entangled photons generated from cold atoms[J]. PRA, 2018, 97(4): 043809. Zhu Z H, Chen P, Li H W, et al. Fragmentation of twisted light in photon–phonon nonlinear propagation[J]. Applied Physics Letters, 2018, 112(16): 161103. Fang W T, Li Y H, Zhou Z Y, et al. On-chip generation of time-and wavelength-division multiplexed multiple time-bin entanglement[J]. Optics Express, 2018, 26(10): 12912-12921. S. Shi, D. S. Ding, et.al. Vortex-phase-dependent momentum and position entanglement generated from cold atoms[J]. Phys. Rev. A 97, 063847. Li Y H, Fang W T, Zhou Z Y, et al. Quantum frequency conversion for multiplexed entangled states generated from micro-ring silicon chip[J]. Optics Express, 2018, 26(22): 28429-28440. Shilong Liu, Zhiyuan Zhou, et.al., Coherent manipulation of a threedimensional maximally entangled state.[J].Phys. Rev. A 98, (6), 062316. Zhang W, Ding D S, Dong M X, et al. Wave-particle superposition of distinct atomic spin excitations[J]. Phys. Rev. A, 2018, 98(6): 063829. Zhang W, Ding D S, Sheng Y B, et al. Quantum secure direct communication with quantum memory[J].Physical Review Letters, 2017, 118(22): 220501..
Dong M X, Zhang W, Shi S, et al. Two-color hyper-entangled photon pairs generation in a cold 85 Rb atomic ensemble[J]. Opt. Express, 2017, 25(9): 10145-10152. Wang K, Zhang W, Zhou Z, et al. Optical storage of orbital angular momentum via Rydberg electromagnetically induced transparency[J]. Chinese Optics Letters, 2017, 15(6): 060201. Shi S, Ding D S, Zhang W, et al. Transverse azimuthal dephasing of a vortex spin wave in a hot atomic gas[J]. Physical Review A, 2017, 95(3): 033823. L.-T. Feng, M. Zhang, Z.-Y. Zhou(共同一作), M. Li, X. Xiong, L. Yu, B.-S. Shi, G.-P.Guo, D.-X. Dai, X.-F. Ren, and G.-C. Guo.On-chip coherent conversion of photonicquantum entanglement between different degrees of freedom. Nat. Commun. 7, 11985 (2016). 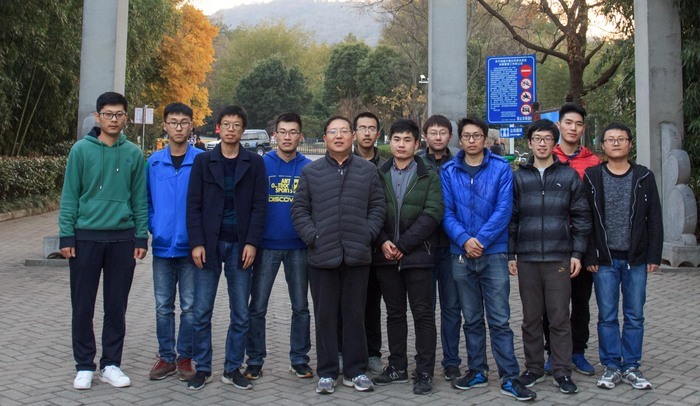 Yin-HaiLi, Zhi-Yuan Zhou(共同一作), Zhao-Huai Xu, Li-Xin Xu, Bao-Sen Shi, andGuang-Can Guo.Multiplexedentangled photon-pair sources for all-fiber quantum networks. Phys. Rev. A 94,043810 (2016). Yan Li, Zhi-Yuan Zhou*, Dong-Sheng Ding & Bao-Sen Shi. Dynamic modeevolution and phase transition of twisted light in nonlinear process. J. Mod.Opt. 63, 2271-2278(2016). Hua Chen, Zhi-Yuan Zhou (共同一作), et al., Experimental demonstration on thedeterministic quantum key distribution based on entangled photons. Sci. Rep. 6, 20962(2016).